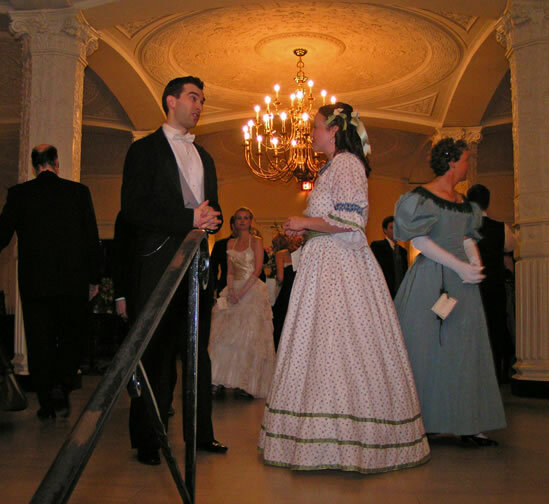 What should I wear to the Victorian Ball? We encourage but do not require the wearing of Victorian formal wear or military uniforms. If it is your first time, we suggest you not wear a costume, but wear modern formal wear and have a look at what other people are wearing. Victorian costuming can get expensive, and we wouldn't want you to spend your money on something that, when you get there, you find to be inappropriate. Most of our patrons are very proud of their outfits, and if you see someone wearing something you like, he or she would probably be happy to tell you how you could get something like it. We are loathe to get into the business of endorsing specific costumers or rental shops, as we don't want to find ourslelves in the middle of the disputes that inevitably result in this business. 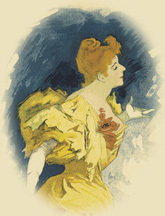 There are frequently fliers and cards from costumers on display at our balls, and you may avail yourselves of those. As to rental shops, very few in the retail trade are very good at historical costuming, and most in the movie business are a bit too expensive. Your experience renting a costume will have a lot to do with your knowing what to look for and a bit of luck. About the only "must" we would recommend would be comfortable, leather soled shoes. 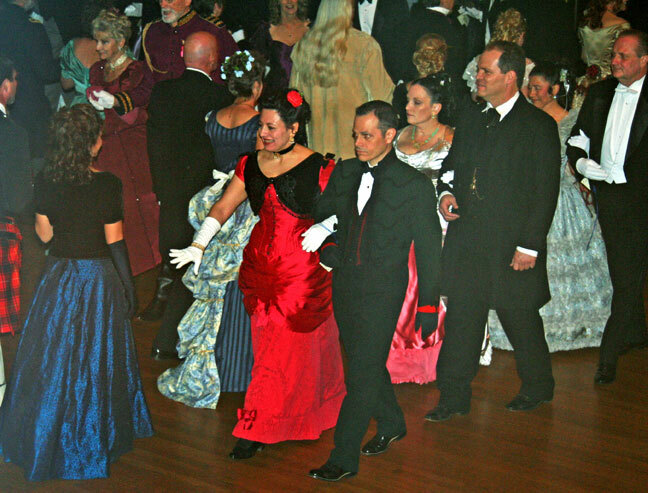 Shoes with rubber soles don't slide nicely, and one must be able to glide over the floor to do a Victorian dance. Rubber soles might be nice for the deck of a sail boat, but they aren't a good idea on a dance floor. The "Gentleman's Page" information about men's evening wear. Trains without some sort of carrying strap. Anything that might snag, slap, stab, gouge, blind, bludgeon, tangle or trip your fellow dancers on a crowded floor. You can never go wrong with white tie and tails. The modern style has some differences in cut from the Victorian style, but as I am not aware of anyone who does "off the rack" Victorian style tails -- and modern tails are easy to obtain and set the right tone, I would suggest going with them. If you are a particular stickler, you can do the research and make or have made some 19th Century tails. Otherwise, check out vintage clothing and formal wear shops and equip yourself with a set of modern tails. You can wear a black or a white evening vest. Gentlemen not in possession of evening attire, but who do have presentable 19th Century day wear (Frock coats, sack coats etc.) are more than welcome to wear that. Failing that, I would suggest a modern tux or failing that, a nice conservative suit and tie. If you are looking to be military, the easiest route is to buy a Civil War uniform. We make no specific endorsements, but they can be easily obtained from any number of vendors. I would suggest searching for "Civil War Sutler" on the web. Note: the Social Daunce Irregulars maintain a policy of strict neutrality, and show no partiality towards uniforms of the North or the South. We also welcome the uniforms of all other nations. Those currently serving in our armed forces are of course more than welcome to wear their dress uniforms. A final note; we do ask that, what ever attire you choose, that gentleman keep their coats on. Shirt sleeves are not in keeping with an elegant tone - especially if the shirt is soaked in sweat. Guidelines for ladies are a bit more difficult. The "Victorian Era" provides a vast number of choices of style and cut, and we do not specify a particular year, decade or form. Hoops, bustles and any number of other styles can be found on our floor. We even have a certain number of those who wear earlier ("Regency" era) and early 20th Century ("Belle Epoche") styles - and this is only those who have historical attire. We also have a fair number of ladies who show up in modern formal wear as well; and all of them are appropriately dressed. In order of our own preference, this is what we would suggest.